Who leads the Heisman Trophy race after Week 8? We’ve now entered the second half of the college football season, which means it’s no longer “too early” to discuss the Heisman Trophy race. From this point forward, each week is more important than the last. Two new faces jumped into the Watchman’s Top Five after Week 8: Clemson quarterback Deshaun Watson, who helped his Tigers demolish Miami on Saturday, and Stanford running back Christian McCaffrey, the do-it-all star who has the Cardinal looking like legit College Football Playoff contenders. But neither newcomer did enough to shake things up atop the Heisman Watch. ​Western Kentucky did a bang-up job of keeping Fournette in check for much of the Tigers’ 48-20 win on Saturday. While quarterback Brandon Harris threw for a career-high 286 yards, Fournette failed to record a run longer than 18 yards against the Hilltoppers. But the sophomore still managed to rush for 150 yards and one touchdown on 5.8 yards per carry. Fournette tied an LSU record with his ninth straight game of at least 100 rushing yards. He now has the ninth-most rushing yards (1,352) through seven games in FBS history. Perhaps more importantly, the Tigers remain undefeated as they head into a bye week before a trip to Alabama on Nov. 7. Fournette’s Heisman candidacy could hinge on how he performs against the Crimson Tide. The number of quarterbacks who have impacted the Heisman race this season can be counted on one hand. Running backs have largely stolen the show. But if Clemson keeps playing like it did Saturday against Miami, someone needs to save a seat in New York for Watson. In the Tigers’ 58-0 bludgeoning of Miami, Watson completed 15 of 19 passes for 143 yards and one touchdown and added another 98 yards with one score on the ground. Watson notched the longest run of his career (63 yards) on a first-quarter drive that set up Clemson’s second touchdown of the day. In the end, Watson helped his offense hang 567 total yards on the ‘Canes. Watson will be interesting to watch in the Heisman race for a couple of reasons. He won’t put up the numbers that, say, Trevone Boykin will at TCU. But Watson is still the ACC leader in completion percentage (69.3) and third in total offense per play (7.45). Plus, few teams in college football look more dangerous than Clemson right now. That’s why winning the Heisman may not require Watson to record insane statistics. He might simply need to maintain the status quo. The Heisman debate of the year has been the fascinating comparison between Fournette and Florida State’s Dalvin Cook. One could make a legitimate argument for either as the country’s best running back, and up until this weekend, both were headliners for undefeated playoff contenders. But Cook’s candidacy took a hit on Saturday. ​Georgia Tech’s game-winning touchdown return on a scooped-up blocked field goal attempt by Florida State’s Roberto Aguayo halted the Seminoles’ unbeaten season. But while Cook isn’t responsible for his team’s special teams blunder, the running back was not his usual explosive self against the Ramblin’ Wreck. The sophomore managed just 82 yards on 17 carries for 4.8 yards per carry, his lowest output since putting up 54 yards (3.6 per carry) in Florida State’s 14-0 win over Boston College on Sept. 18. In fairness to Cook, he’s battled a hamstring injury during the last couple of weeks. But Georgia Tech’s normally sluggish run defense did a good job of limiting one of the most explosive rushers in college football. 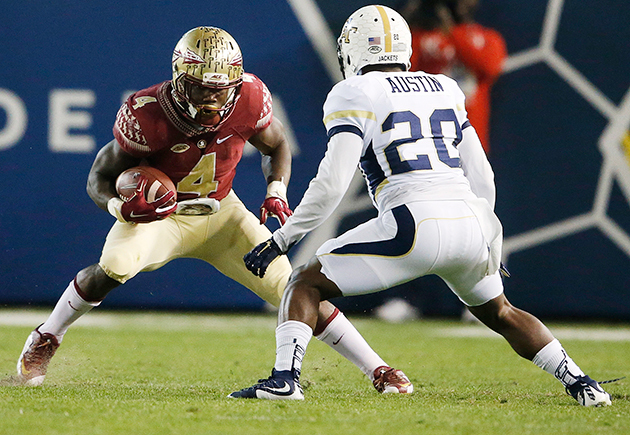 The loss also delivered a major hit to Florida State’s playoff hopes. Even if the ‘Noles win out, the selection committee isn’t likely to favor a one-loss ACC program given the conference’s lack of depth. That’s bad news for Cook if a player like Fournette remains the star of a top playoff contender. Alabama’s Derrick Henry breaks about four tackles en route to a touchdown in the Tide's 19-14 win over Tennessee. Cook can’t get caught looking ahead to Florida State’s matchup with Clemson in two weeks. He first must face Syracuse, and a bounce-back performance could push Cook back onto the Heisman radar. The Mountaineers have lost three straight games since starting 3-0. In those three games their defense has given up a combined 139 points. That’s a recipe for disaster against Boykin and the Horned Frogs’ offense on Thursday night. Washington State welcomes Stanford to town having just beaten Arizona, 45-42. But McCaffrey and the Cardinal could have a big day against a Wazzu squad that ranks last in the Pac-12 in rushing defense (5.06 yards per carry allowed).